I was immediately affected the moment I heard about the bombings at the Boston Marathon in April. I'm a relatively new runner, but I hope to someday run a marathon, and even if not, I realize that the Boston Marathon is the preeminent event of all US marathons. The course is also right where I was one year ago for two weeks, at my association's annual conference on Boylston Street. I watched the horror unfold with absolute shock that awful April 15. I was already signed up for the Peachtree Road Race in Atlanta (where my sister lives -- she invited me to come down and run it with her and her boyfriend) which has about three times the entries that the Boston Marathon does (Peachtree now caps out at 60,000 entries). It wasn't going to stop me from running it. That would only be what they want. But it did make me nervous. I heard about a fellow Chicago Running Blogger, Katie of Live Half Full, organizing a Run for Boston 5K in not-too-far Libertyville on the two-month anniversary of the tragedy. I signed up immediately. I'd been working so ridiculously hard for the last two months that I'd had time to run about, oh, five times since April. For this race, I was not expecting a PR or even a mildly good performance. But I suited up anyway in Boston Marathon Blue early on the morning of June 15 and drove north to Libertyville. The clouds had looked iffy when I departed my place, but I hoped the weather would at least hold out until the end of my race. The second I put my car into park in the parking lot at the Independence Grove forest preserve, the site of the race, raindrops began to hit my windshield. It was literally that instanteous. Luckily I had prepared and brought a running hat (made of a tech material that deflects water), but as we neared start time, the rain started falling harder and consistently. It was basically full out pouring by the time we lined up for the start. But it was so great to hear from Katie and also the folks from Boston who came out to support the race, namely the representative from the Who Says I Can't foundation (which the race supported). Katie announced that we'd raised $10,000 for Who Says I Can't which was amazing. I set off at the starting gun with expectations to perform poorly. 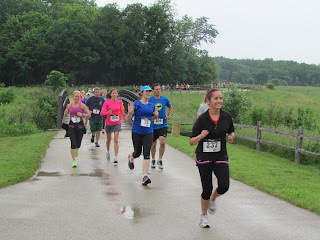 The course was beautiful -- we ran around the lake in the forest preserve on the trail, which was picturesque despite the weather. The only issue I really fond with the course was the water station. The water station was placed at about the 1 mile mark, so I did not pick up any water at that point, since it was very early and with it being that early (not at say the 1.5 mile mark as usual for a 5K) I figured there would be a water station at Mile 2. There was not. forever, an amazing feat considering I had barely run for two whole months. Once I was nearing the finish, I realized I was about to hit a new PR. I didn't know how, I didn't understand why (I had barely run in two months!) but I was. Luckily, my "push" song was playing as I rounded the corner to the finish and I threw whatever I could into that last 0.1 miles and finished with what I eventually found out to be a 26:23 PR (by 1:30). 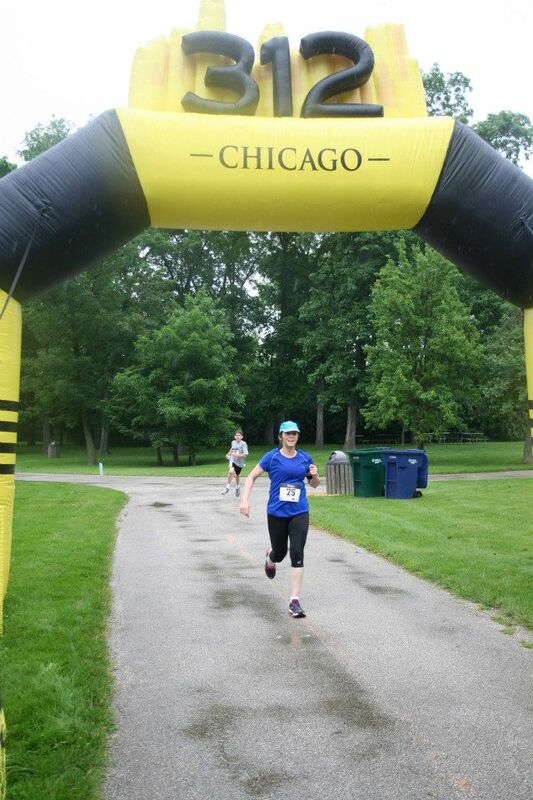 I love my finishing photo -- I am flying off the pavement, even at the finish line. After crossing the finish, I was presented with the finisher water bottle, and grabbed some water and a banana. Sponsors Rosati's and Goose Island 312 beer were present, and I helped myself to some pizza and a, OK a couple, delicious cold beers. Hey, it's good to get some carbs in you after a run, right? RIGHT?! Anyway, I just felt so pleased with the whole experience. Even if it was a little disorganized, as a meeting planner I understand. The first time you plan any event, there are going to be hiccups and unexpected hurdles. You can't always fix them immediately. It's something you plan for the following year. You just do the best you can and enjoy yourself, which is what I personally did. I was not only happy crossing the finish line because I knew I had PRed and because I felt like I could run for another five miles, but also because I knew that I was running for something important. I was proud to be a part of this event. Recently, I returned from an annual two-week business trip. I know what you're thinking. "Oh, boy, eating out for every meal for two weeks? How did that go?" Well, last year during this trip, I lost weight because as a meeting planner, I was sprinting around a convention center for a week and a half and didn't have time to eat. This year, I thought I'd lose weight or at least maintain. But I changed my tactics and the results were disastrous. Just as I'd predicted a Kings/Penguins Stanley Cup Final, the exact opposite occurred. I gained. Six pounds. Of course, I know exactly what I did wrong, and it's the same thing that got me to 230 lbs in the first place. Apparently, my weakness remains: if you put it in front of me, I will eat it. The thing with these convention center shows is that all the snack break food and beverage options are unhealthy -- cookies, brownies, rice krispy treats, etc. My new tactic this year was based on how things went last year. Whenever I saw some food out, I ate it, because I didn't know when I was going to next be able to eat. However, this meant that if I saw a big plate of cookies in the staff office, I ate two. Later in the day, if they were still there, I'd eat one more. It was like everything I'd worked toward, all the mindset changes had gone right out the window. I knew while I was eating two big cookies that it was wrong and I shouldn't be doing it, but I did anyway. I ordered a cheeseburger and fries for dinner anyway. None of it was terribly satisfying to me taste-wise, but I did it anyway. Even as I was shoveling fries into my mouth, I was thinking, "What the hell am I doing?" But I knew exactly what I was doing. I could feel it in how my clothing fit, I could see how I looked a lot thicker in those clothes that I looked just fine in last week. How could things have gone so wrong? Well, I discovered that my willpower can be dented from time to time. That I am still subject to the "if it's in front of me, I'll eat it" temptation. And occasionally, I will give in to that temptation. Giving into it once in a long while might be OK. But the problem this time is that I gave into it several times per day every day for two weeks. What's funny is that now that I'm back home, my desire for those cookies and burgers and fries has faded. With a 5K scheduled for Saturday, I ran four miles this morning and have consumed about a third of my calorie allowance for today (and it's almost 4pm). I passed by a Long John Silver's in my neighborhood this afternoon and about gagged. I'm back on the wagon. Is it just so simple that I don't have the cookies and burgers in my home? Possibly. But I think also as soon as I stepped on the scale this morning and saw just how much damage I'd done, in number form and not just my clothes, I shocked myself back into reality. We all experience bumps in the road when it comes to weight loss, but the most important thing -- the thing that really reveals one's character -- is how one responds to those bumps. As for me, I know I can't keep doing this. This will not happen again. I will not go back.